Mocko jumbies are the colorful stilt-walkers who perform at parades and festivals throughout the Virgin Islands. Attend any of the islands’ annual carnival parades and you will see them, jumping, balancing and stepping out to the sounds of up-beat soca music. Mocko jumbies have an equally colorful history, as I learned watching Mokolution: The Evolution of the Moko Jumbie, an hour-long documentary about mocko jumbies (or moko jumbies) in the U.S. Virgin Islands. The film was financed by the U.S.V.I. Department of Tourism and produced by Willard John, culture bearer and founder of the Guardians of Culture Mocko Jumbies performance troupe on St. Croix. It is a recording of a live performance and historical presentation held at Fort Frederik in Frederiksted, St. Croix in July 2008. 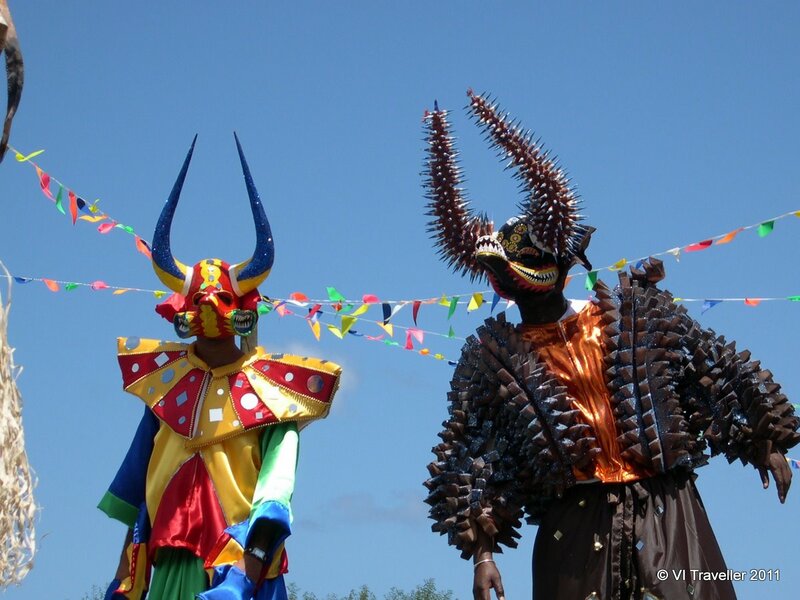 Mocko jumbies have their origin in Africa where masked and costumed stilt-walkers fulfilled a spiritual role among tribes in the Gambia, Senegal, Ghana, Nigeria and other countries, says John, whose succinct presentation of the history of the art form forms the backbone of the film. Stilt-walkers were known by different names in Africa and their spiritual function also varied: they represented the powers of the gods; they were able to communicate with the ancestors and they played a role in coming of age ceremonies. John goes on to explain that when Africans were enslaved in the Caribbean they brought their culture with them, but due to laws which restricted slaves from practicing African religions mocko jumbies evolved into a secular, festive custom. Research has found the presence of mocko jumbies in the Caribbean as early as the 1770s. Exactly what these early mocko jumbies looked like is not fully known but in the film we see a first-generation mocko jumbie performance, as imagined by John. The stilt-walkers wear African-style dress, are fully masked, and seem to challenge and instruct the audience through their dance. In more modern times, between 1870 and 1950, mocko jumbies traditionally appeared wearing women’s dresses, colourful bloomers, masks and conical hats. John introduces us to two early practitioners of the art form, a Barbadian named Fritz Sealey better known as Marshall who played mocko jumbie on St. Croix from the 1920s to the 1940s, and John Farrell, better known as Magnus, a St. Croix native who was a mocko jumbie all his life, practicing the art form first in St. Croix, then in St. Thomas where he moved in 1939, and finally in New York where he lived from the 1960s onward. During this era, there was a slightly menacing character to the mocko jumbies’ performances. The jumbies were costumed, fully masked and towered overhead. And mocko jumbie was a “clandestine craft”, says John: they didn’t rehearse in public and it was not clear one became a mocko jumbie. Children, upon seeing a mocko jumbie approaching, would run home to hide. Mocko Jumbies wearing masks at the August Monday parade in Tortola. The modern era of the mocko jumbie and their remarkable growth in popularity in the Virgin Islands, can be attributed to one man, says John. As a boy Alvin ‘Ali’ Paul saw Magnus perform in the 1950s in St. Thomas and he wanted to become a stilt-walker. But Magnus was not forthcoming when Paul, as a 10-year-old child, asked him questions about the art form. So one day Ali followed Magnus home and saw where he stored his stilts. Ali came back and inspected them, memorizing their design and construction. 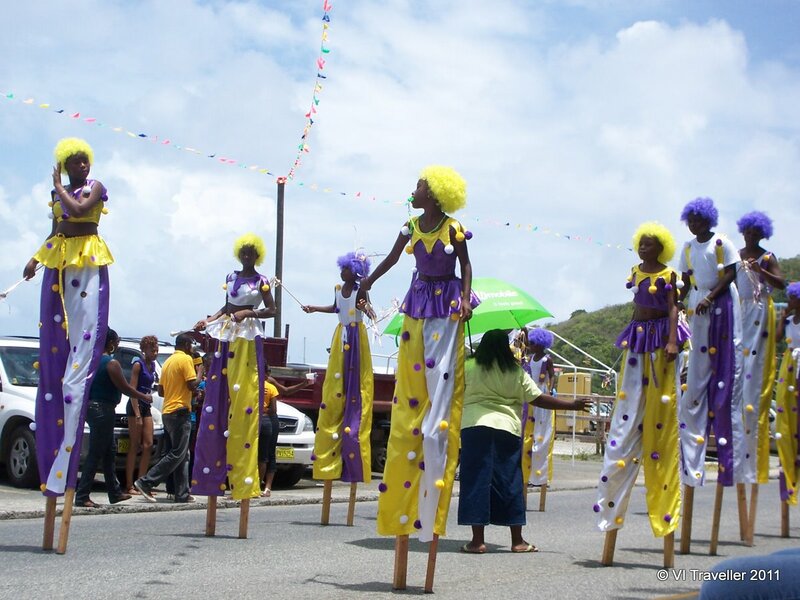 Ali spent two years building his own stilts and practicing his dance and in 1960, at the age of 12, he made his début in the St. Thomas Carnival Parade. Over the years Ali Paul revolutionized the mocko jumbie. He improved the stilt design and introduced the modern costume—a pair of loose-fitting pants, sometimes covered with a partial skirt. (John reports that Paul introduced the pants because spectators sometimes tried to look under the traditional dresses which mocko jumbies wore, which could cause the stilt-walkers to become distracted or lose their footing.) Paul also willingly taught others who wanted to learn how to be a mocko jumbie, and he opened the door to women who wanted to learn the art form. For the first eight years of his career Paul was the only mocko jumbie on St. Thomas but today there are dozens, if not hundreds, of persons who in the Virgin Islands who have learned how to perform as a mocko jumbie. Willard John was one of those students who learned the art form from Ali Paul. Willard John established the Guardians of Culture Mock Jumbie troupe on St. Croix in 1979 as well as the Mocko Jumbie Academy at the Ricardo Richards Primary School a few years later. John says that the influx of younger performers to the art form has introduced more dancing, acrobatics and stylized choreography. This is the style of performance we see at parades, festivals and parties in the Virgin Islands today. Interestingly, John reports that since many other Caribbean islands where the mocko jumbie art form once flourished did not have Ali Pauls of their own, the tradition died out. So an art form which once existed around the Caribbean is now most closely associated with the Virgin Islands. The lesson: “The best way to preserve culture is to live it,” as John says at the close of the film. The DVD features segments in which John tells the history I have recounted above—eloquently and in greater detail. In between there are mocko jumbie performances which reflect each stage in their history, from the African spiritual stilt-walker to the youthful, acrobatic dancers. We also see masqueraders who entertain and taunt the crowd with whips and antics and the old-style mocko jumbie, who wear ladies’ dresses, cone-shaped hats and dance to traditional fungi music. You can feel the excitement when modern-day mocko jumbies appear with high energy and the pulsating beat of VI soca music. Mokolution gave me a deeper appreciation of the mocko jumbie tradition. I always enjoyed mocko jumbies—who doesn’t? They are unique, entertaining and easy to admire with their fancy footwork. But I will observe them with new eyes from now on, eyes that see their connection to Africa and to the men, and now women, who have kept the tradition alive over the years. The film also raised questions for me, particularly about the mocko jumbie tradition in the British Virgin Islands. I’d like to know whether the stilt-walking tradition here evolved separately or whether our own modern-day jumbies also trace their teachers to St. Thomas and Ali Paul. 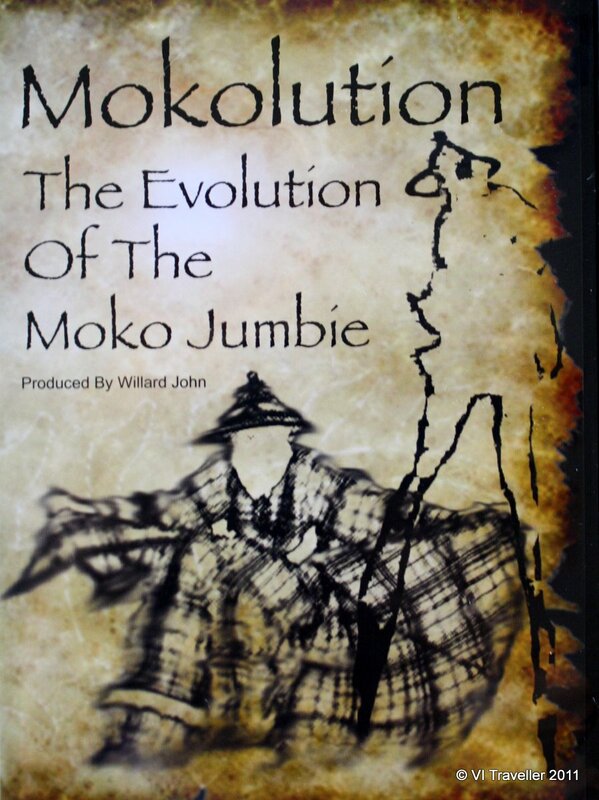 Mokolution: The Evolution of the Moko Jumbie (2009) was produced by Willard John with post-production editing by WTJX. The documentary is available in shops around St. Croix including the Fort Frederik Museum Shop. The film is also available on You Tube, in five parts. Find Part 1 here.